We are a team of ASE certified mechanics that have created this car service guide. Learn why the brake warning light is coming on and what's goes wrong with your car's brake system. This guide will show you what you can do to fix it. The brake warning light is a multi functional light which is connected to three different monitoring devices. The first is the brake fluid level sensor in the brake master cylinder. Next is the parking brake lever or foot actuator arm which tells you if the emergency brake is still on while driving and the final warning is if the brake system has had a drop in brake pressure in the brake system. This red brake warning light is designed to warn you of a pending danger that affects the immediate braking ability of your car. This danger can affect the front or rear portion of the brake system. The cost of fixing a brake warning light can vary because the cause of the problem can be a minor problem such as adding brake fluid to the master cylinder $2.00 (US). 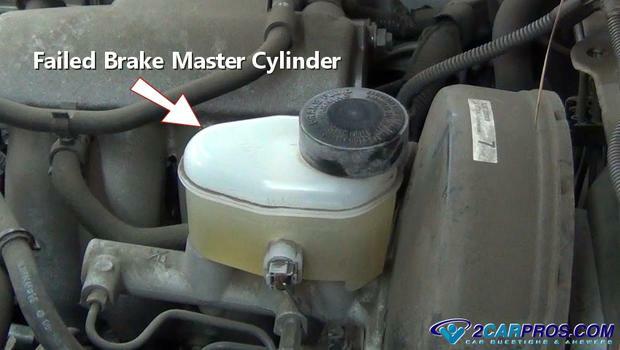 Replacing the master cylinder can cost between $35.00 and $65.00 (US) if you are doing it yourself and up to $250.00 (US) if you are having it done at a repair garage. Park your car on level ground and lift the hood. Have a flashlight ready for inspection. Check the Brake Fluid: A minimum amount of brake fluid must be present in the system for it to work correctly. A fluid level sensor is located in the brake master cylinder fluid reservoir which monitors this level. With the hood open locate this reservoir and check the fluid level. There are only two reasons for this fluid to be low. The first is a leak in the system which could be at the rear of the master cylinder. A brake caliper seal has failed or a rear wheel cycling is leaking. More obscure problems include a brake flex hose or one of the steel lines has rubbed through on the frame. The second and more popular reason is the brake pads have worn down and need replacing. Here is a video on how to replace a leaky brake caliper. And a video how to replace a leaking rear wheel cylinder. Video on how to replace a leaky brake flex hose. Check the Parking Brake: The parking brake level or pedal is equipped with a warning switch which is designed to inform the driver that the parking brake is still on. This is to avoid overheating the brakes which will cause damage to them. Check to make sure the brake lever is all the way down. If your car has a parking pedal reach below the pedal pad and pull it upward. Occasionally the switch that monitors the pedal or handle can break or become misadjusted which will keep the light on. Replace the Brake Master Cylinder: The brake master cylinder is designed to supply hydraulic pressure to the front and rear brake independently. This design is used to ensure that if one portion of the brakes fails the remaining portion will still work. When the seals in the master cylinder fail the disproportion in brake pressure will turn the brake warning light on which means the brake master cylinder will need to be replaced. This condition is usually followed by a low or fading brake pedal. Reset the Proportioning Valve: A brake system proportioning valve is designed to monitor the front and rear brake pressure. When a difference in pressure is detected it will trigger this valve which in turn turns the brake warning light on. If repairs have been made and the light is still on the valve must be reset by pushing hard and quickly on the brake pedal. This action should push the proportioning valve plunger to the center of the valve and turn off the warning light. If you have any questions about brake warning lights please visit our forum. If you need car repair advice, please ask our community of mechanics who are happy to help. Our service is always 100% free.